Just 50 years ago, large herbivores like Banteng, Asian Elephant, and Eld’s Deer as well as predators like Indochinese tiger and leopard were so abundant in the Dry Forests of North and Northeast Cambodia that scientists compared this ecoregion to the savannas of East Africa. In the troubled decades that followed, however, habitat destruction and hunting greatly reduced animal numbers and diversity. Today, the largest intact dry forests in Indochina remain in north-eastern Cambodia in an area known as the Eastern Plains Landscape (EPL). WWF-Cambodia works in two key protected areas in this landscape, Mondulkiri Protected Forest and Phnom Prich Wildlife Sanctuary. Even in these areas, animal numbers are critically low, especially of large herbivores and their predators. With its largely intact dry forest habitat, the area forms part of the tiger landscape with the highest potential for recovery in Asia. With increased protection effort, there are already many signs of improvement, particularly of leopard, and prey species such as banteng, deer, and wild pig. This leaves hope that, at some point in the future, wildlife in the EPL can be restored to its former glory. Srepok Wildlife Sanctuary (SWS) is a protected area of nearly 400,000 hectares (4,000km2) located in the Eastern Plains Landscape of Mondulkiri province, Cambodia. 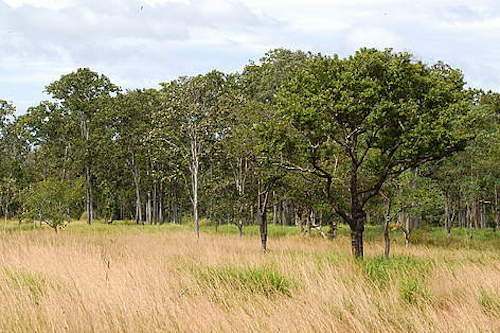 The area is considered an important representative sample of the Lower Mekong Dry Forest Ecoregion and was first designated Mondulkiri Protected Forest by The Royal Government of Cambodia in July 2002, before being renamed in 2016. 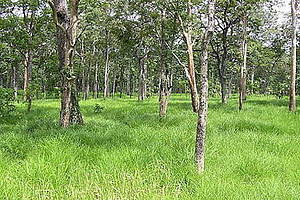 It is managed by Cambodia’s Forest Administration, with technical support from WWF. Srepok Wildlife Sanctuary contains many wildlife species characteristic of the Lower Mekong Dry Forest ecoregion within the Eastern Plains. This protected areas still holds the three wild cattle species banteng, gaur, and wild water buffalo. Deer species include the endangered Eld's deer, and wild pig are abundant, seen in groups of as many as 100 individuals. Cats are well-represented in the area including small numbers of tiger, an increasing number of leopard, relatively many jungle cat, and possibly a few clouded leopard and fishing cat. Other carnivores include Asiatic jackal and dhole, or Asian wild dog, as well as sun bears and several civet species. The forest also contains a rich diversity of primates including black-shanked douc and Germain's silver langur as well as pig-tailed and long-tailed macaque. The trapeangs (watering holes) in SWS (and throughout the Eastern Plains) provide breeding habitats for threatened water birds including sarus crane, critically endangered giant and white-shouldered ibis as well as lesser and possibly greater adjutant. Three critically endangered vulture species, slender-billed, white-rumped, and red-headed vulture, maintain nesting populations in the protected area and are given periodic supplemental feedings of domestic cattle carcasses through a joint monitoring effort of WWF, WCS and BirdLife International. Other charismatic bird species observed in the area include great and oriental pied hornbills, green peafowl, silver pheasant, and great slaty woodpecker. The critically endangered Siamese crocodile is present in small numbers in the Srepok River and its tributaries within the Wildlife Sanctuary. Turtles and tortoises are commonly confiscated from poachers collecting them for the wildlife trade, most often the endangered elongated tortoise. Water and Bengal monitors have also been sighted and confiscated from collectors. Snakes that have been observed include king cobra and Burmese python. Large individuals of several fish species are still caught in the Srepok River including rare species like seven-striped barb or giant carp. Freshwater sting raysmay also be present. An Irrawaddy dolphin was last seen in the upper Srepok in 2005. Phnom Prich Wildlife Sanctuary (PPWS), roughly 225,000ha (2,225km2) in size, is another critically important protected area in the Eastern Plains in which WWF is supporting government conservation efforts. PPWS was established in 1993 by Royal Decree although former King Sihanouk had already designated Phnom Prich a forest reserve in 1962, originally as a refuge for the now extinct Kouprey. 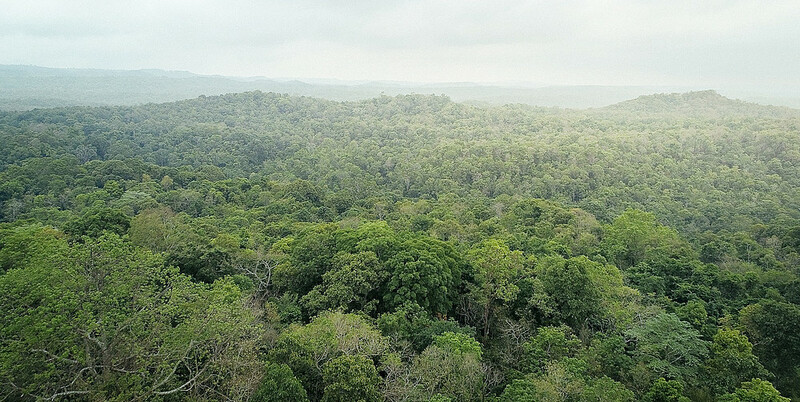 Today, Phnom Prich Wildlife Sanctuary covers 2,225 square kilometres – more than 15% of the total area of Mondulkiri province – and forms part of one of the largest remaining relatively undisturbed landscapes in mainland Southeast Asia. PPWS is notable for its rich habitat diversity, ranging from hilly evergreen forest to open dry dipterocarp woodland and seasonally wet grasslands. The wildlife sanctuary hosts the core area for the largest Asian elephant herd in eastern Cambodia. Recent camera trapping shows that there is good recruitment with many calves seen in photographs. Wildlife also includes the mega-herbivores banteng and gaur as well as populations of the endangered Eld’s deer. These and other herbivores form the prey base for an unknown number of Indochinese tigerpresent in the sanctuary, and a survey is underway to estimate tiger population size more accurately. Other key carnivores include leopardand clouded leopard, as well as marbled cat, jungle cat, and dhole. Phnom Prich is one of the last global strongholds for the endangered green peafowl, and the elusive white-winged duck has also been spotted inside the protected area. This wealth of ecosystems is due to the sanctuary’s very diverse elevational structure varying between 80 to 640metres that has created a rich, intricate mosaic of forest habitats: About 50% of Phnom Prich’s forests are dry dipterocarp with an additional 40% semi-evergreen and 10% evergreen forest. These open forest mosaics support globally significant populations of animals characteristic of both dry and dense forest ecosystems, particularly large mammals and waterbirds, many of which have been extirpated from most other parts of Southeast Asia. The Lower Mekong Dry Forest Ecoregion is characterized by a mosaic of habitats. The main forest type is deciduous dipterocarp forest. On higher quality soils or at higher elevation, areas of mixed deciduous forest and semi-evergreen forest occur. This mosaic of forest types is one of the reasons why such a large quantity and diversity of species are home to this landscape – the diverse forest patches act as key resource areas and refugia for a lot of wildlife. Deciduous dipterocarp forests typically have an open canopy combined with a grassy understorey. Members of the forest’s namesake family Dipterocarpaceae dominate the vegetation. While all other Dipterocarp-trees are evergreen, the six species in the dry forest are the only ones that lose their leaves during the dryer months of November to April. This is likely to be an adaptation to the region’s climate with its strong, extended wet and dry seasons – shedding the leaves decreases the trees’ surface area and reduces the amount of water that the trees lose due to transpiration. Semi-evergreen forests have a taller and more multilayered forest structure than deciduous dipterocarp forests. While such forests are similar in structure to lowland evergreen rain forest, they grow in areas with lower and more seasonal rainfall and are characterized by lower species diversity. Bamboos are common in the semi-evergreen forests of Cambodia’s Eastern Plains Landscape, especially along seasonal waterways and after disturbance. Within the Dry Forests Ecoregion, semi-evergreen forest patches are essential in providing shelter to large mammals and key resources to many species. Interspersed within these forests are seasonally inundated wetlands; natural clearings that provide sources of food and water for a wide variety of wildlife, especially during the latter stages of the dry season. These wetlands, along with scattered permanent pools along seasonal river beds, form a crucial resource network throughout the Dry Forests ecoregion, especially in the Eastern Plains and help to maintain many of its ecological processes. In partnership with the government and other NGOs, WWF has developed the Dry Forest Ecoregion Action Programme. At the landscape scale, this programme addresses a broad range of threats to the Dry Forests such as conversion for agriculture, illegal wildlife trade, land encroachment, and infrastructure development. At more local scales, such an approach also has positive impacts for conservation projects at the site level. Efforts to protect and conserve the Dry Forests landscapes are socially, financially, and politically sustainable. More than 25,000 people live in the eight communes surrounding Mondulkiri Protected Forest and Phnom Prich Wildlife Sanctuary – about 30% of the total population of Mondulkiri province. These communities are comprised of eleven ethnic groups, the indigenous Bunong, Khmer, and Lao being the three largest. The area was largely depopulated during the Khmer Rouge period and in the time that followed. Many families did not return to their villages until the late 1990s. Today, population size within the protected area’s community zones is increasing by about 800 people each year. This trend is likely to continue due to natural population increase and continuing immigration. Access to basic social services is relatively low as a result of inadequate facilities and poor service quality. Streams and rivers are the primary source of domestic water supply, with a limited number of hand-pumped tube wells in some communities. There are primary schools in all villages, but the number of classrooms and teachers is insufficient in more remote areas. Literacy rates are low throughout the area. Improving community livelihoods in and around protected areas in an important objective in WWF's work in Cambodia. As part of its community work, WWF-Cambodia gives technical support to community fisheries groups and encourages sustainable collection of non-timber forest products like resin or honey. There is increasing pressure on the natural resources from residents and migrants living in and around the area. Loss of forest cover and encroachment on previously uninhabited forest, combined with several years of national and regional turmoil, has resulted in serious threats to fauna and flora. Hunting for local consumption and poaching for domestic and international wildlife trade is the greatest immediate threat to wildlife in the dry forests. Human-wildlife conflicts are also expected to increase in the future. Illegal logging of high value "luxury" timber threatens to degrade patches of semi-evergreen forest that form critical habitats for wild cattle and elephants. Population growth puts pressure on natural resources, especially as the road network improves and the needs of people exceeds the amount of land available for wet rice production. Mining for gold and bauxite puts the future integrity of forests and river systems at risk, especially with exploration concessions also awarded within protected area boundaries. Mining leads to chemical and sediment pollution, increased demand for wildlife and timber, increased clearing of land, as well as spread of diseases from introduced domestic animals. Ambitious plans for upstream hydropower development on the Srepok River threaten the entire Srepok ecosystem because of changes to the river’s flow regime, possible pollution, and barriers to fish migration and reproduction, as well as habitat destruction via roads, forest clearance, and flooding. Fishing in the Srepok River and its tributaries has apparently exceeded sustainable levels as fishermen have noted a significant decline in fish catches in the past few years. If this trend continues, local fish population will be heavily affected. Tapping of liquid resin is a traditional practice of local people but carries collateral risks due to opportunistic hunting by collectors, diseases spread by domestic ox and dogs, as well as disturbance due to fire. Introduced plant species may displace native plant communities while providing little value for wildlife. Several such alien species have already become established in protected areas, and numbers are likely to rise with increasing human disturbance. Climate change models predict more pronounced dry seasons that could change the dry forest mosaic of the Eastern Plains in unforeseen ways, possibly reducing the proportion of semi-evergreen forest and likely also changing the fire regime. Concessions to commercial agriculture threaten to seriously disrupt the wildlife corridors between protected areas. Long-term connectivity between the region’s protected areas, including between Cambodia and Vietnam, is essential for the long-term protection of the Eastern Plains Landscape. In Mondulkiri Protected Forest and Phnom Prich Wildlife Sanctuary, WWF and its partners are using an approach that has been successfully implemented in Southern Africa. ‘Wildlife Conservation by Sustainable Use’ demonstrates how wildlife conservation can contribute to economic development. The strict protection zone acts to conserve wildlife populations and all hunting and logging is prohibited. The community use zone provides land for established communities to graze cattle, grow subsistence crops, and collect non-timber forest products. The regulated use zone acts as a buffer between the first two zones and as a corridor for animal movements within and between protected areas. Finally, the ecotourism zone is set aside for development of tourism infrastructure and ecotourism activities. Lessons from Southern Africa have also provided useful tools for engaging local communities in direct monitoring of biodiversity and natural resources through MOMS (Management-Oriented Monitoring System). MOMS is an approach developed in Namibia that has proved extremely successful in allowing communities to organize themselves and take responsibility for managing their natural resources, in return for the right to harvest wildlife and other forest resources. WWF and government partners have adapted this approach and gradually introduced it to the Eastern Plains.